Aortic aneurysm is a weak area in the aorta, the main blood vessel in the body that carries blood from the heart to the rest of the body. As blood flows through the aorta, the weak area bulges and grows over time. This bulging may eventually rupture. Aortic aneurysm in the abdominal region of the aorta is referred to as an abdominal aortic aneurysm (AAA). 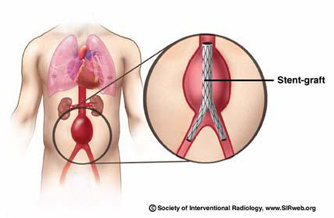 An aortic stent graft placement is a minimally invasive procedure in which a stent graft is placed inside the aneurysm, creating new walls over the weak spot in the vessels. This graft redirects blood flow to stop the pressure on the weak vessel wall to prevent rupture.